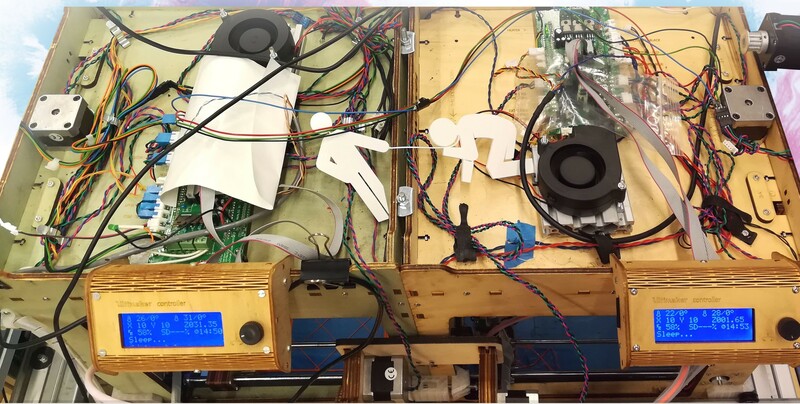 Rapid XXL prototyping improving robotics develpoment. 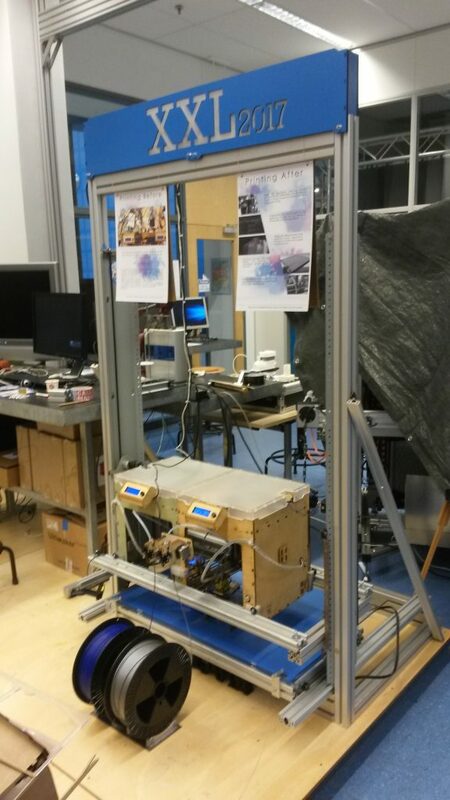 In collaboration with the Robotics Stabilize machine we gave functional purpose to large scale printing. Programming the post processor for the generated G-code. The key feature in solving difficult object preparation. Testing with different kinds of overlaying techniques. Experimentation led to the finest and toughest overlap structure. Drastically improved visual design. Making the consumer feel comfortable with the printer they work with. Adding additional hardware like LED’s and stepper motors to further improve print quality and consumer satisfaction. Prototyping an accesible design does not mean only the cutting process had to be developed. To make the printer look less frightening, cable management in combination with a brand new laser cut top cover let the consumer print at ease. LED’s have been added to improve day- and nighttime visibility. Stepper motors underwent an upgrade in order to advance print quality. New air flow canals were laser cut to boost the cooling efficiency. An advanced Pi case was fabricated to enhance electronic safety. Also, a brand sign was constructed to complement the overal visual design. All of these design improvements embellish the printer and the printing process itself. We are a team consisting out of four multi disciplined students. Together we delved into the subject of 3D printing to get a better understanding of the subject and its specifics. The purpose of the program is to generate 2 gcode files for the XXL printer. It splits a model in 4 parts: A,B,C and D with overlap The purpose of the program is to generate 2 gcode files for the XXL printer. It splits a model in 4 parts: A,B,C and D with overlap and add additional toolchange scripts and layer changes. Part A and B are written to the Master file and C and D are written to the slave file. Between every different subobjects there are toolchanges and Layerchanges. New coordinates meant that new extrusion values had to be calculated as well. Prototyping a succesfull post processor for the G-code brings more challenging objectives with it. To overcome the problem where the master stopt sending external X movements as soon as it only needed to print one final part, we inserted ‘empty layers’ to make sure external X movements are always present. Hereby the slave can always continue printing in the correct position. In order to keep both printers print in sync, the layer height was pulled from each layer and put into the layer change post process script.